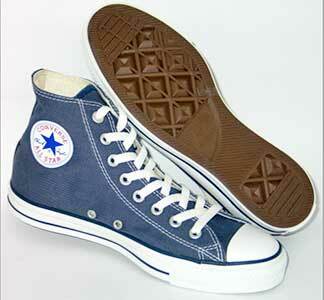 Navy blue high top chucks. There was a day when nothing made a boy’s heart race like opening a shoe box and seeing a pair of Converse Chuck Taylor All-Stars, hi-tops, staring back at him, lying side by side, heel to toe. Chucks were basically the only basketball shoe there was, the only basketball shoe that mattered. Remember when mom would try to pass off Pro Keds or some other pretender a couple of bucks cheaper as chuck-worthy? Mom, mom, mom. We knew better. Knew not to even look at non-Cons, God forbid actually wear them in public. Chucks were for the day. Chucks were forever. Chucks were where it started. Chucks were where it ended. Wilt scored 100 in chucks. Dr. J, Larry and Magic, Converse endorsers later, were Con men from the jump. They cut the teeth of their greatness in their off-white, rubber-and-canvas classics, adorned with an ankle patch with a star, bordered by the magic name Chuck Taylor written in script. . . . This moment in time is brought to you by the recent news that Converse, overwhelmed by debt and its minuscule market share, has filed for Chapter 11 bankruptcy protection from creditors. Converse will close its three North American plants, move all of its manufacturing to Asia and see what happens. Certainly the outlook is poor, and yet the die was cast long ago; Converse, flanked by emerging brands with exciting innovations and skilled marketing, fell hopelessly behind. Chucks — named for the Converse salesman who traveled the country for 40 years dispensing shoes from his Cadillac — took a particular hit. In a market eventually dominated by leather, velcro and air cushions, chucks became immaterial for basketball. They were repositioned as quirky urban fashion statements, offered to renegade kids and retro dads in colors like “hot chocolate” and “cotton candy”. For a time, the strategy took. But on the whole, that fame was fleeting. Now, Converse’s very future is doubtful, and with it the fate of its legendary product — still very much for sale, every day since the family-run store opened in 1946, for $24.95 at M&G Sales in Norfolk, the Army-Navy warehouse on Granby Street. With few exceptions, chucks, in every color they can get their hands on, are the only sneakers shopkeeper siblings Larry and Laura Friedman sell. In the mid-’70s they stocked up on red chucks when Dr. J wore the same for the Virginia Squires and sparked a local fad. Recently, they outfitted the cast of “West Side Story’’ in new chucks when it was in town, then shipped reinforcements to New York when the show departed. Chucks move constantly, the Friedmans say, but best in spring and summer when casual fashion is more in mind. “Boys have calmed down on them,” Laura Friedman says, “but girls are hot and heavy for them.” That could turn into a widespread rage should word come with certainty that chucks — introduced as All-Stars in 1917, with some 600 million sold since — are not long for the world. Sadly for a nation’s memories, if not its fashion sense, Friedman may soon have no choice.